When The Parent Trap was released nationwide in June of 1961, love and marriage were on our minds. Life Magazine that week featured a cover touting “Weddings Worldwide” in its pages and in the White House a young family was seemingly living out our ever-after daydreams. June 21 was a Wednesday (it will be in 2017, too) and, if astrology is your thing, this was all taking place under the zodiac sign, Gemini—the twins. 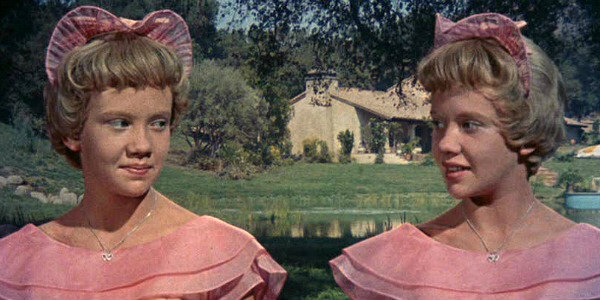 All of this is to say that it was a pretty auspicious time for Disney to release a movie starring a singular Hayley Mills as long-separated twins who discover a whopper of a secret (and then another): first, that the other sister exists at all and secondly, that when the girls were just babies, their parents divorced, evenly bisecting custody; one sister to California to live with dad (a rakish Brian Keith) and one to Boston to live with mom (plucky Maureen O’Hara and her terrific peekaboo brogue). Susan and Sharon meet at summer camp and though initially confused about their identical looks (save for different haircuts), decide the best way to handle the situation is to become instant enemies, making camp life miserable for one another. Their punishment is isolation in a shared cabin and forced companionship that ensures it isn’t long before the tension breaks and confidences—the currency of teen girls—start flowing. Susan lives the bucolic life on a ranch in California with dad, Sharon gets a tony Boston address with mother, but neither knows much about the absent parent. Still, it’s not long before they put the whole story together and hatch the kind of plan that could only work in the movies—to switch places and rekindle their parents’ love. By ’61, Disney had a handle of tackling difficult subjects in their live action features—they’d already released Johnny Tremain (his hand!) and Old Yeller (his dog)—and proved they could do so with a sensitive touch. Even though there’s plenty of treacle to be found here (and undeniably this is a movie aimed at kids), it’s hard to watch it cynically and the effect is only cloying if you want it to be. The mannered way Shannon and Susan discuss the sorry state of marriage “these days” seems at first just adult mimicry but a more empathic interpretation reads it is an earnest attempt to make sense of a complex and painful situation. As a certified whimsy-hater, I might seem like an unlikely champion of this movie, but the charming sincerity of Hayley Mills and the mannered studio razzle dazzle of bygone Hollywood are a relief compared to the recent parade of teens coerced by too many scripts to respond to moments of onscreen sincerity by saying, “Awk-ward” in that same sing-song way. If the film is formulaic, it’s only in the comforting sense, like remembering which cabinet at your parent’s house is for mugs and which is for bowls. There’s plenty to just sit back and enjoy here (and at two hours-plus, I do mean plenty) without overanalyzing: the pastel, time-capsule appeal of 1961, the giddy feeling of trying (and, at least in my case, failing) to spot inconsistencies in the split screen effect, the visual delight of the scenery—particularly the sunny Monterey scenes and jealousy-inducing mid-century modern rambler where Susan and her dad live. And, like me, you may even grow to love, and then hate, and then love again the film’s Billboard top 10 hit, “Let’s Get Together,” as it flits in and out of your consciousness for weeks. If you’re in need lately of a sweetness chaser to help everyday life go down easier, give this one a chance to do its thing.